Mike's Music and Sound Inc - Used Ludwig Black Beauty LTD Ed #108 14"x5"
USED GEAR → Used Ludwig Black Beauty LTD Ed #108 14"x5"
This is a current consignment item at Mike's Music and Sound. Unfortunately, a great friend and customer passed away this past year and our store is helping the family sell some of his percussion and recording gear. The 14x5 snare is unplayed and was kept in its case - it does show some light pitting on a couple of lugs and spots on the interior head damper and the throwoff. 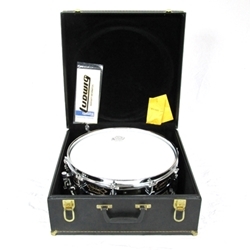 Our staff will carefully pack the snare drum in it's own box before we ship. If you have any questions please feel free to message us.